Recently released US Topo maps for Florida now feature more trails using data provided by the U.S. Forest Service as well as trail information from other federal, state and private sources. Several of the 1,028 new US Topo quadrangles for Florida now display parts of the Florida National Scenic Trail (FNST) and other designated public trails. For Gulf Coast residents, recreationalists and visitors who want to explore the featured Florida trails by biking, hiking, horseback or other means, the new trail features on the US Topo maps will be useful. The FNST is a congressionally-designated, long-distance hiking trail that weaves its way across more than 1,000 miles of Florida from Big Cypress National Preserve in the south to Gulf Islands National Seashore in the western end of Florida’s panhandle. The Trail is a national treasure, being one of only 11 National Scenic Trails in the country, and one of three contained entirely within a single state. The USGS partnered with the U.S. Forest Service to incorporate the trail data onto the revised Florida US Topo maps. The Florida National Scenic Trail, joins the Appalachian National Scenic Trail, Arizona National Scenic Trail, Continental Divide National Scenic Trail, Ice Age National Scenic Trail, Natchez Trace National Scenic Trail, New England National Scenic Trail, North Country National Scenic Trail, Pacific Crest National Scenic Trail, and the Pacific Northwest National Scenic Trail, as being featured on the new US Topo quads. The USGS plans to eventually include all National Scenic Trails in The National Map products. The U.S. Forest Service has provided boundary and road data for the US Topo map series for the past five years, and is now working on a national dataset of recreational trails. Some of the other data for new trails on the maps is provided to the USGS through a nationwide “crowdsourcing” project managed by the International Mountain Biking Association (IMBA). This unique crowdsourcing venture has increased the amount and diversity of trail data available through The National Map mobile and web apps, and the revised US Topo maps. During the past two years the IMBA, in a partnership with the MTB Project, has been building a detailed national database of trails. This activity allows local IMBA chapters, IMBA members, and the public to provide trail data and descriptions through their website. MTB Project and IMBA then verify the quality of the trail data provided, ensure accuracy and confirm the trail is officially designated for public use. Further significant additions to the new quadrangles include map symbol redesign, enhanced railroad information and new road source data. 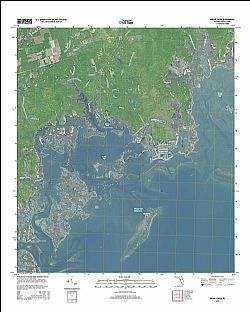 The new 2015 US Topo map coverage over Florida replaces the first edition US Topo maps for the Sunshine State and are available for free download from The National Map, the USGS Map Locator & Downloader website , and several other USGS applications.